Broadcasters Air Public Service Messages | Broadcast Public Service: Local Stations. Big Impact. 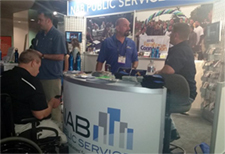 At the 2015 NAB Show in April, NAB Public Service provided non-profit partners with the opportunity to share their PSAs with radio and television stations. Local broadcasters are an invaluable resource to non-profit organizations, as they communicate critical public service messages to communities across America. NAB recently released this video of public service partners thanking broadcasters.